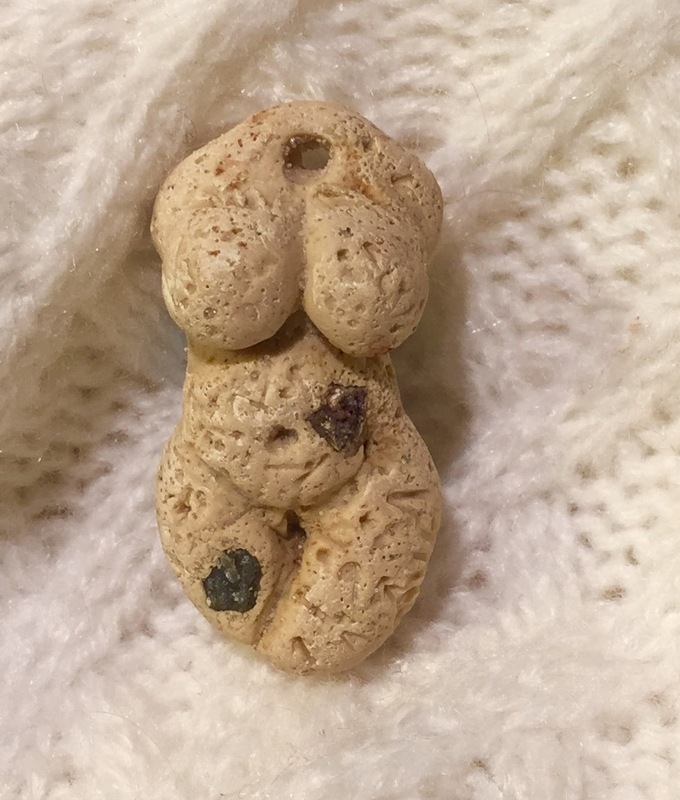 Polymer Clay Faux Limestone Goddess Bead, by Karen A. Scofield. Picture was taken in natural light. 1st Attempt. I have decided to develop my own faux stone polymer clay recipes for beads and other purposes. I’m making my own recipes for two reasons — I want to use what I have (lots of decade-old clay and odds and ends) and then draw on my childhood. It was very tactile and full of color. We went rock hunting as a familiy and both my brothers became geologists. I’m more on the artistic end of things. My mother was born in Estonia, I never got to visit the country, but this is inspired by Tufa limestone from there. It’s associated with springs, is a chemically precipitated soft and porous limestone. I have some inclusions I’ll want to add to the clay, they’re in the oven right now, so future versions may include them. Polymer Clay Goddess Beads by Karen A. Scofield. Baked two. The left is of Fimo Soft Marble and the right is of the artist’s own faux limestone recipe. Picture was taken in evening indoor lighting this time. 1st attempt at Tufa limestone. Needs improvement. Anyway, while the grandson took his afternoon nap, I did a visual study of different limestones, and quickly pulled out some of my older clays, sand, beach stones from the local beach, half an old wanut shell, some crumbly old clay mixes, my molds, and embossing powders. I have an ever-growing stash of my own bead prototypes and their molds that I occasionally pull out to play with various faux polymer clay rock/wood/semiprecious stone recipes. Thank goodness for two-part silicone mold putty like Amazing Mold Putty! Very durable stuff. Anyway, here texture and other touches are added after molding, that’s where the pitted beach stones and old walnut half come in, and sometimes the bead has to be reshaped a bit after being textured. 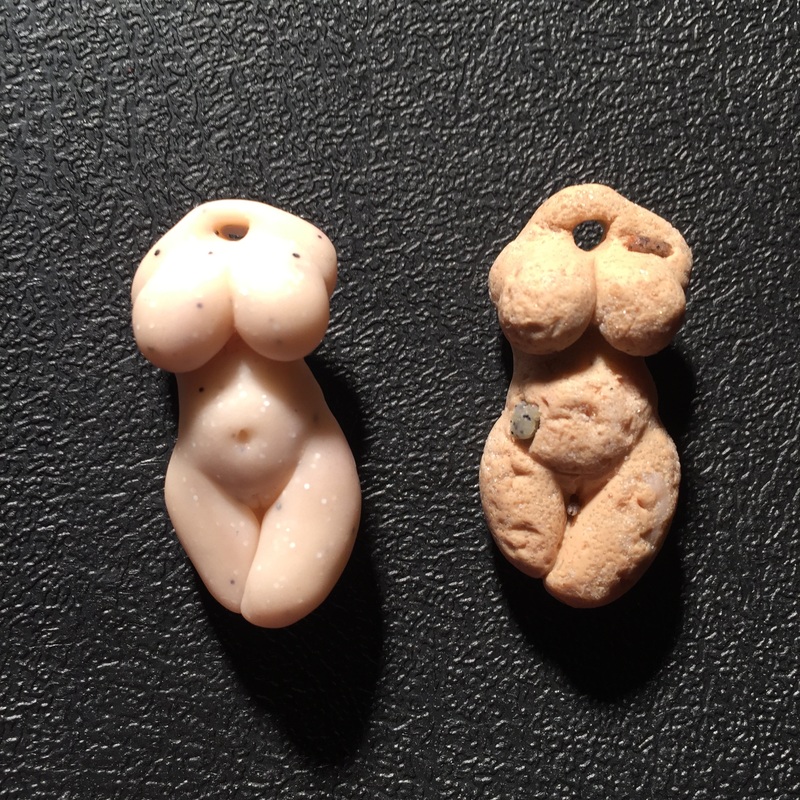 I seek to explore both ancient and modern renditions of goddess/mom/fertility beads like these. 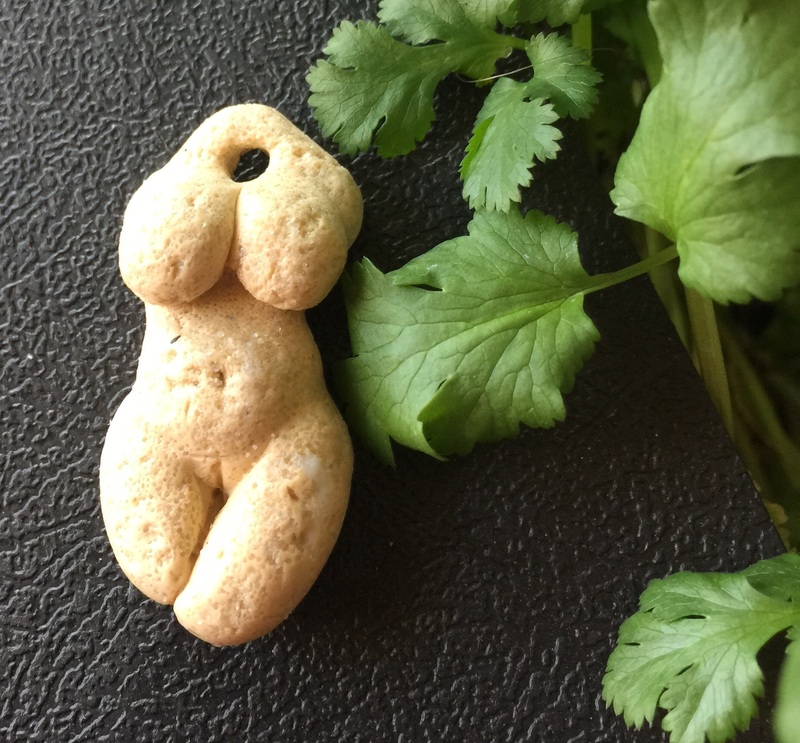 Unless it’s very fresh, Cernit Doll clays can be hard and crumbly out of the package … but it’s one of the best polymer doll clays on the market. That confuses a lot of people because most clays are partially cured when they’re crumbly like that (partial curing can start to occur at 90 degrees F). Cernit clay, however, can be crumbly just because that’s its nature if it’s not manufactured quite recently. Don’t immediately assume this polymer clay is impossible to work with just because it’s crumbly. See “Can You Condition Hard, Crumbly Polymer Clay or Should You Get New Clay?” It lists three methods of conditioning hard, crumbly polymer clay. Adding Fimo MixQuick isn’t so much a problem with doll clay, specifically, because many doll clay artists already do that to add flexibility so little fingers and toes don’t break off so easily during shipping. Is Cernit Doll-Making clay more difficult to condition? Sometimes. The quality of the clay, it’s strength, the skin-like transparency level and color can be worth it and many hyperrealistic art doll artists choose Cernit Doll clays. With Cernit Doll clay, you can have more control over the softness and firmness of the clay once it’s conditioned precisely because it’s more temperature sensitive. That can be a tremendous plus. Food Processor to the Rescue! — I’ve had great success with taking the old Cernit Doll clay and mixing it with Puppen Fimo (now Fimo Professional Doll Art Clay) and/or a 1/3 to a 1/2 package of Fimo Mix Quick (which one can get from JerrysArtarama.com). Place these in a larger food processor that can handle harder work and whir it around on high until it’s very finely pilled. If the Cernit is really hard and crumbly, I put my Cernit Doll clay into a food processor until it becomes a fine crumbly mess. Then I add the Fimo Mix Quick and maybe some Puppen Fimo too. Some of it will stick to the food processor walls but a rubber/silicone spatula can help you get it out. Jar or Bag It and Let it Sit — Remove the contents into a wide mouth glass container or zip lock bag. I prefer the glass jars. Let it sit for a few days to let the plasticizerrs on the MixQuick do their work and soften crumbly clay. Fastidiously Clean Your Food Processor As Soon As Possible — Clean with rubbing alcohol and wipes and dry before next use. Labeling and Attaching a Baked Chip — Once the clay is in my glass jar, I take an index card write what’s in the glass jar, how old the clay is, and baking instructions. I pause to bake a well blended chip. I have found I can easily punch a hole in a 1/4″ thick chip with a hole puncher meant for paper. 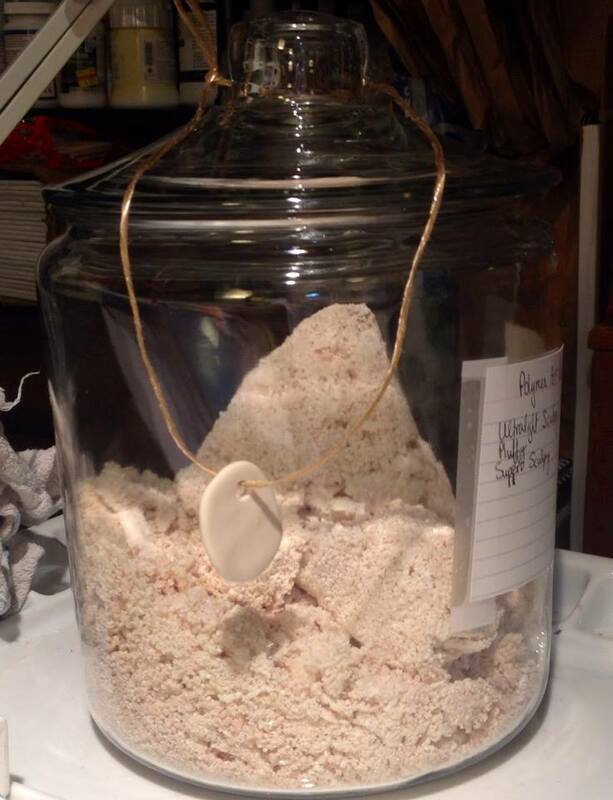 I tie it to a string and attach the chip with the string to the glass jar that contains the far clay or clay mix. If I have any notes about tendency toward moons or to darken while baking, I add that to the index card and tape it to the glass container. Cover your Jar — If you think it might sit a while, you can cover your jar with a pillow case or homemade cover to keep out the light. Use It — When I’m ready to work with it, I put on disposable latex gloves (not thicker household rubber gloves), pinch together a bit of clay, and start conditioning it with my hands. I work on a clean polymer clay mat and will often rub my work station and hands with scrap polymer clay kept for this purpose — it picks up what your hand washing and wipes may have left behind. If that doesn’t work, refer to “Can You Condition Hard, Crumbly Polymer Clay or Should You Get New Clay?” again. Origin: Belgium. Made by The Clay and Paint Factory S.A. Yes, they have a Facebook page. Availability: May be more easily available in Europe and other places than in the US. Strength and Durability: One of the strongest clays in its properly conditioned and cured state. Shipping: Cernit is more susceptible to transportation and storage temperatures/conditions when in the raw. Cured, it’s one of the strongest clays but finished works still should be well protected/padded during shipping. Shelf Life: It should be stored in a cool, dry, dark place. Some people have used 20-year-old Cernit with no problems. Obviously, it may last this long only if transported/kept in a cool, dark, dry place. Reformulations may affect shelf life? The brand is more sensitive to transportation and storage temperatures than other clays. Multiple Stations: It saves time and sometimes a great deal of frustration to have different stations at which to paint, sew/costume, play with settings, and photograph. For example, once I got wool roving all over my work station, loose bits and all, fibers flying into the air (no, I didn’t shake it about), I had to clean my work station and studio several times and still found those little wool fibers here and there. They’re a pain to get out of polymer clay. So I have a folding table in the living room to use as a wigging and costuming station. I wish I had the space for various permanent work stations but I don’t, so folding table it is! Cernit Doll Clay Colors: Has range of doll clay colors and can be mixed with each other or other brands to tint. Cernit Doll Biscuit color deepens after baking and Cernit Doll Almond is not quite as yellow. Conditioning: Warm briefly but sufficiently against body before conditioning. It’s misleadingly crumbly right out of the package but once conditioned may produce superior results, providing that the reason that it’s crumbly is not because it was partially cured due to improper transport or storage temperature. (Most clays are crumbly because they’re partially cured but Cernit is crumbly out of the package before conditioning because that’s the nature of the clay, unless it’s freshly made within the last month(s).) To condition, try pressing it for a while at first more than rolling and twisting. It may get “sticky” if it becomes too warm in the hands. Proper conditioning is crucial to attaining the clay’s ceramic-like, slightly translucent quality though. Note: Stays softer longer once conditioned, as opposed to other brands of polymer clay. Cross-Brand Mixability: Yes. Cernit can be mixed with other brands of polymer clay and Fimo MixQuick. Sculpting: Uses some different sculpting techniques than the rest of the polymer clays. Some people make their doll in Super Sculpey or another clay, create a mold, and then make their item out of Cernit Doll Clay. Others do fine by using warm tools and/or hands when blending clay during a sculpt. Many (most?) sculpt and series bake (bake then proceed to next stage/part) when using Cernit Doll. Lighter colors may make it more difficult to see sculpting details. Check with a mirror and photos that you take of it. Blending: It is reportedly the most difficult to smear or blend one piece onto another – a feathering and pressure method is often used. Some people report that a Cernit 50/50 with the Classic Fimo blend makes for better doll sculpting. Many add Fimo QuickMix to Cernit and use Sculpey diluent to ease blending. Armatures: Cernit can get softer while sculpting and baking and needs more excellent and carefully constructed support (armature) than perhaps other clays might. Water: No! Cernit possesses a filler (natural clay, possibly kaolinite) that absorbs moisture. Therefore, talc or cornstarch are the better release agents and Sculpey Diluent/Softener is better for smoothing the clay than using water. While you can rebake your doll many times, you may want to avoid bake times longer than necessary when using the light colored doll clays. Light colored and translucent clays can yellow an darken a bit if baked too long. Experiment and know your clay. Know Your Oven – Test your oven — Moniter temperature throughout the baking process, with one to two independent oven thermometers. Test Your Brands and its Particular Colors – Lighter colors and translucent clays are more susceptible to darkening or yellowing while baking. Test, test, test. Test bake times and temperatures in of your brands and colors. Also, lighter and translucent colors will have to be buried in baking soda and/or covered with polyester polyfil. Cure the clay without sudden temperature changes. Place your covered and protected polymer clay piece(s) into a cool oven, turn the oven to the correct temperature, and begin timing only once the proper temperature has been reached. Once baked, turn off the oven but leave your items inside the oven until they have cooled. This is to help avoid cracks and fissures. Some people bury their Cernit beads or dolls in baking soda to avoid thermal shock and to insulate from oven hot spots. Dolls can lay on a bed of baking soda. Others protect against thermal shock or hot spots by covering item(s) or parts of it with polyester batting (does not burn or melt at these temperatures). Lighter Colors of Doll Clay — Lighter and translucent colors will have to be buried in baking soda and/or covered with polyester polyfil. Series Baking — Cernit can be baked in stages (“series baking”) so you can add fine details without marring the sculpted piece. Let the clay cool completely between each layer to prevent air pockets and defects in the finished piece. Sufficient Oven Temperatures — Cure at sufficient temperatures and avoid water or too much hand sweat in order to avoid cracking/figures but verify your oven’s temperature with a separate thermometer (or two!) and to cover your items while baking to protect against burning or dark spots. Polyfil for the Delicate Areas — Cover delicate fingers, toes and other parts with thick layer of polyfil. Choice of Oven — A digital convection oven is more temperature accurate than a regular home oven and a toaster oven is your most volatile and least accurate, as far as temperature accuracy and steady temperature are concerned. The reason that toaster ovens are your worst choice is that it doesn’t circulate the heat and spikes occasionally in order to bake! A regular home oven can suffice just fine with proper testing, baking, and monitoring methods. Choice of Cooking Container – You want a covered or tented pan for baking your dolls. Metal pans and wing components heat up faster and higher than glass, ceramic and many other materials. If the recommended temperature says 265-275 it will bake correctly on glass, but be darker on the edges if you use metal cookware. Surround your doll with a layer of polyfil and monitor delicate wings and fins as much as you can while they are in the oven. Convection Oven Tent — Some people tent their doll, meaning they create a tent of aluminum foil over a basic tent armature and use that as a tent to put over their doll while baking in a digital convection oven. The Home Oven Disposable Pan “Clamshell” – Create an enclosed baking contain by placing one disposable aluminum baking pan over another to create a covered cooking pan, then clip shut on both ends. You’ll have placed a glossy ceramic tile on the bottom of this and will have surrounded your doll with polyfil, including a layer of polyfil under it to prevent flat, shiny spots where the doll rested on the tile. Or the doll can lay on a bed of baking soda and have hands and feet wrapped in polyfil. Test Bake with Independent Thermometers — Do a test firing before baking each doll. Test your oven with one to two independent oven thermometers. Do not depend on the oven’s indicator regarding whether the proper temperature has supposedly been reached. Test your oven’s actual internal temperature for about 40 minutes to see if it a) attains the desired temperature and b) doesn’t spike high enough to burn your doll. It is possible to burn parts of the doll but underbake the rest of your doll. First Bake – Place your art doll in a cold oven, set the oven temp so that it actually attains 230 degrees F. Once it attains that temperature, set your time for 18 minutes or so. This first bake can decrease chance of cracks and fissures and firms the doll up just enough to work it before the final cure. You must do the following though. Cool the Oven With Doll in It — When your timer goes off, prop the oven door open a bit and let it cool completely. Do not handle your doll. Keep it in the oven with the door open a bit and let cool completely. First Scrape and/or Sand — Scrape and or sand with 320 – 600 grit fine wet/dry sandpaper, keeping the sandpaper wet while working. Scrape larger lumps, sand the rest of the body. Rinse your doll clean. Acetone Rub — Clean it lightly with acetone and a cosmetic cotton pad if you need to remove white scratches or lumps found in any larger areas of your doll. Second Bake — Place your art doll in a cold oven, set the oven temp so that it actually attains 270 degrees F. Once it attains that temperature, then set your time according to the doll’s thickness. Cool the Oven with the Doll in It — When your timer goes off, prop the oven door open a bit and let it cool completely. Painting – You do not have to heat set acrylics. If you use Genesis Paints, once it’s painted, put your doll back in oven and fire for 5 minutes at 250 degrees using the above method of placing your doll in a cold oven, etc. Cool the Oven With Doll in It — When your timer goes off, prop the oven door open a bit and let it cool completely. Embossing Gun Option for Genesis Paints — An embossing gun cures the genesis paint faster and is a better way than putting the doll back into the oven for that paint firing. One must use a thermometer to monitor temperature, however, and constantly move the Embossing Heat Gun back and forth over the surface of the painted areas to avoid burning, etc.